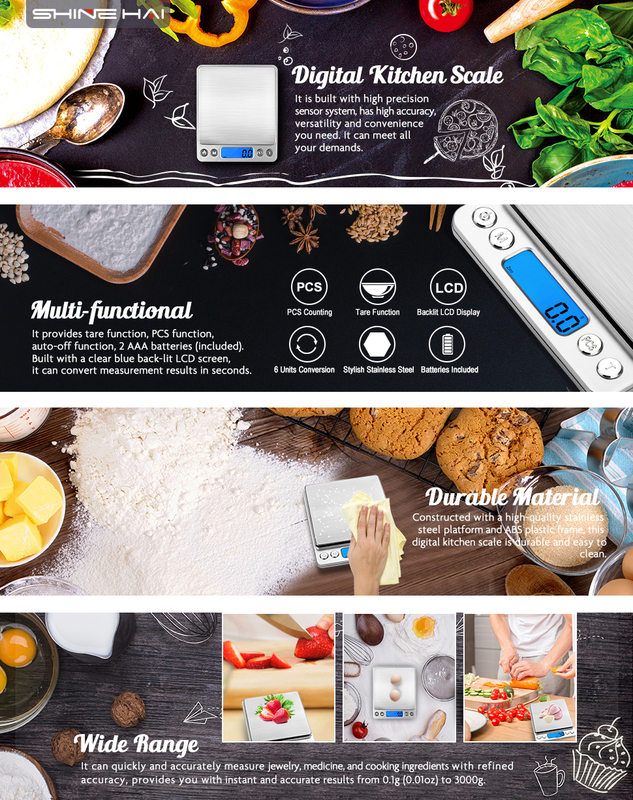 High-Precision & Wide Range: SHINE HAI food scale built with high precision sensor system, provides you with instant and accurate results from 0.1g (0.01oz) to 3000g. Easy to clean and use, make it an ideal to measure jewelry, medicine, and cooking ingredients with refined accuracy. Smart Button Functions: The \"PCS\" function enables you pieces counting such as pins, beads, screws; The \"T\" function will provide a net weight; The \"M\" function helps you choose the proper unit. The switch time can be set to 60\", 120\" and 180\". Besides, it can alert users for low battery power, overload, and uneven surface placement. Stylish Design & Space Saver: Minimalistic and elegant design, its mini and compact size (Product Dimensions: 4\" x 5\" x 3/4\". Platform Dimensions: 4\"x4\") takes up minimal space on your desk, makes it a pro pocket scale makes it easy for carrying. Multi-Functional: Built with a clear blue back-lit LCD screen, it can convert measurement results between in g, oz, ozt, ct, dwt and gn in seconds. Comes with two trays (13cm, 10cm), which can be used as protectors or scale trays. Meet your demand of measuring different things. SHINE HAI digital kitchen scale has high accuracy (0.1g), versatility and convenience you need, whether your focus is diet management or culinary excellence. It can meet all your demands. It can quickly and accurately measure ingredients, postage, medication and more with a weight range up to 3000 grams. Calculate in g, oz, ozt, dwt, ct and gn convert between units instantly with a single press of a button without having to re-measure. This digital table-top scale includes piece counting function, which is incredibly helpful for hunting, jewelry, and cooking. It's simple technology for a smart living. 1. When the scale is turned off, press and hold "M" key, at the same time, press "ON/OFF" key for 4 times quickly till number is displayed, then release the button.